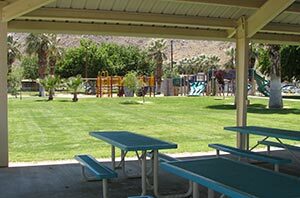 The City of Twentynine Palms Community Services Department and the Parks & Recreation Department provide a multitude of services and activities for the community and visitors, as well as two fully-equipped community parks and a skateboard park, public swimming pool, sports facilities, children’s playgrounds, BBQs and picnic shelters. The Recreation staff offers classes and activities for youth and adults, including seasonal sports programs, fitness and martial arts classes, leisure activities, and Summer Movies in the Park. Luckie Park and Knott Sky Park have covered picnic shelters available for special events. Reservations must be made at least two weeks in advance. Fees are required to reserve shelters. Call the recreation office at 760-367-7562 to check availability and to make reservations. The Community Services Building is available to rent for meetings, conferences, dinners, special events, and Luckie Park Pool is available to rent for special events. Reservations must be made at least two weeks in advance. Fees and insurance are required to make reservations. Call the recreation office at 760-367-7562 for information. Knott Sky Park offers grassy areas, shade trees, children’s playground equipment, covered picnic shelters, recreational activities, and baseball/softball fields. 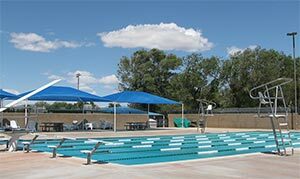 Picnic shelters are free to use, or can be reserved for gatherings and special events for a small fee. History: Knott Sky Park is a historic local property that once belonged to the Knott family, of Knott’s Berry Farm. It originally housed cottages for guests of the Knott family who came out to the desert for parties and special occasions, plus a small airstrip for landing private planes. 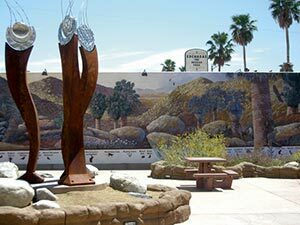 Bucklin Park is a pocket park located downtown next to the Twentynine Palms Visitor Center & Art Gallery and Chamber of Commerce building. The park has benches and a shaded picnic table area. Art features in the park include kinetic sculptures by artist Steve Rieman of Yucca Valley and the city’s Mural 21, Our Neighbors in Nature II, by Larry & Nancy Eifert of Port Townsend, Washington (2006). 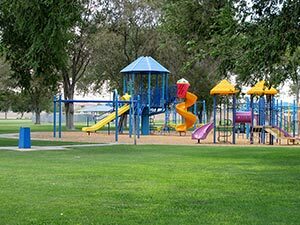 The park was named after Gerald “Bucky” Bucklin, a retired Marine, retired Sheriff, and longtime volunteer in Twentynine Palms. Historic Plaza was the original commercial heart of Twentynine Palms, housing early local businesses in the 1920s and 1930s, including the Bagley Market, which is featured in the park in the full-length Mural 10, Frank and Helen Bagley–The Bagley Store, by Dan & Janis Sawatzky of Chemainus, B.C. (1997). 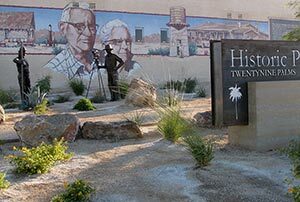 Also in the pocket park are two bronze sculptures of local 1930s homesteaders and desert surveyors Bill and Ada Hatch, by Kay Henkel and John Branstetter of Palm Desert (2010). Sitting benches are available but no picnic shelters. The city’s original community park features acres of grass and shade trees, a walking path and exercise equipment, a skateboard park, public swimming pool, ballfields, basketball and racquetball courts, horseshoe pits, soccer field, and more. Picnic shelters and BBQs are free to use, or can be reserved for gatherings and special events for a small fee. In June and July, the Recreation staff offers free family-friendly Summer Movies in the Park on Thursday nights (see info below). History: The park evolved from its beginnings in the 1930s as home of the American Legion Desert Outpost 334 to its official dedication on July 4, 1965, as “Luckie Park,” named for land-donor, WWI veteran, and Pasadena physician Dr. James B. Luckie, who is credited with helping to populate the city by sending World War I veterans suffering respiratory ailments to live and homestead in the dry climate of Twentynine Palms. A public swimming pool was built on the site in 1929 by veterans and community volunteers. Luckie Park Pool opens Memorial Day weekend and is available for weekends only until the second week of June. Thereafter, the pool will be open 7 days per week until mid-August (weather permitting). Hours of operation for public swim are 1:00 p.m. to 5:00 p.m. Available for Adult Lap Swim weekdays 11:30 a.m. to 12:30 p.m. Food, beverages and tobacco are not allowed in the pool area. Children in diapers must wear a waterproof covering. Life jackets are the only approved flotation device allowed in the pool. Lifeguards are on duty. Appropriate swim attire must be worn. T-shirts, denim shorts, etc., are not allowed. Children under the age of 8 must be accompanied by an adult. If your child does not know how to swim or is a beginner or weak swimmer, it is imperative that they are supervised by a capable adult. Please DO NOT LEAVE YOUR CHILD UNATTENDED at any time while at the pool! 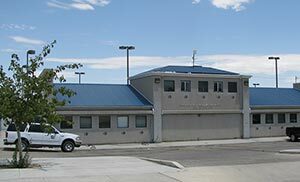 Public Swim hours: 1:00 to 5:00 p.m. The 29 Palms Skateboard Park is open 365 days a year, located on the south end of Luckie Park, off Utah Trail at Joe Davis Drive. Hours are 6:00 a.m. to 10:00 p.m., and the park has night lighting. Admission is free. No age limits. Protective gear is required. Free family-friendly movies are shown on Thursday nights during June and July in Luckie Park, under the beautiful desert night sky, presented by the City of Twentynine Palms Park & Recreation Department and local business sponsors. Movies are shown on the north-facing wall of the racquetball courts, beginning after sunset, about 8:30 p.m. Bring a blanket, lawn chairs, picnic, family and friends! Concessions are available for snacks and beverages. Admission is free. For more information, contact the Park & Recreation Dept. (760) 367-7562.